5 Which One is Right For You? When creating a website for your multi-location business, it is easy to overlook certain aspects of the process. One of the most forgotten component is that multi-location sites need to have a unique SEO site structure. Whether your company has locations across your city, state or entire country, you are going to need to build your site differently than you would if you had only one location. However, it’s not nearly as daunting as it seems and is more than worth the time and effort. Since most purchases are still made at physical locations, the focus of your website is going to remain on each of your locations no matter how many you have. Numbers don’t lie. That is a massive opportunity that you may be losing out on if your site isn’t structured in a location friendly way. Here are a few ways that you can structure your website to make sure you’re driving traffic to each of your locations. This is an aggregated page containing a list of all your physical locations, and nothing else. The setup of the locator page will look something like this. An example of this would be Mastermind Toys, as you’ll see below. You can clearly see each location on the locator page. When you click into each location, you’re presented with a pop-up window of where the location is, how far it is away from you, and some additional information. These are dedicated landing pages for each of your locations. These are meant to be more targeted for each locale and provide more detail. The location page acts as an expansion of your locator page. Each location will have its own unique page. You always make sure each location’s name, address and phone numbers (NAPs) is accurate and up to date. You’ll also need to set up an embedded Google Map as well! Google is your friend when it comes to location pages. Don’t forget to optimize your Google My Business listings as well. All of their stores are listed alphabetically on their directory page, which serves as an all-inclusive locator page. If you click on each store, you’ll be taken to a unique location page. There, you will find the regular store hours, as well as more information such as who the store manager is, any special deals or promotions going on at that specific store, and plenty of other relevant information. This is where things get a little more complicated. Internal microsites are a set of dedicated landing pages for a specific location. Instead of just having one page for one of your locations, this will structure your site so you have multiple subpages for each one. Your main site might target a general set of keywords while each of your microsites will target local keywords. Each of your internal microsites will give you the opportunity to target long tail local search terms based on the products and services that each of your locations offer. 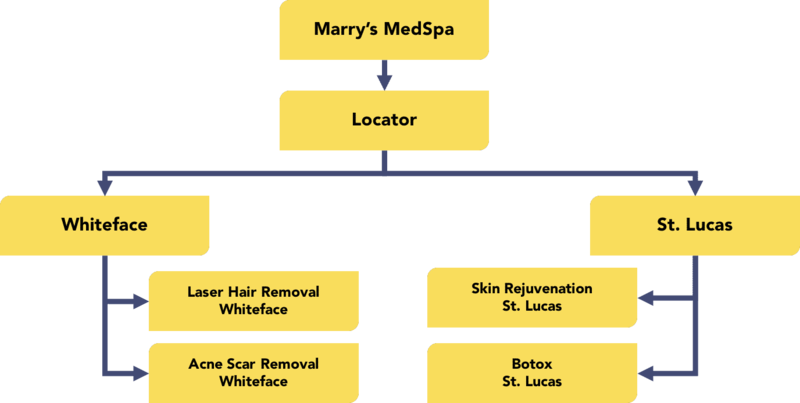 You can see from the example above that each microsite for Mary’s MedSpa shows specific pages for each service in order to rank locally for each one. For example, there are separate pages for both skin rejuvenation and botox in St. Lucas. Internal microsites also allow you to create content that is unique and resonates more with each locale you operate in, while your main pages allow you to speak broadly about each product or service that you provide. Keep in mind that a Facebook page does not count as a microsite! This is a common misconception when setting up websites in this format. These microsites will give you a huge boost in your SEO efforts, allowing you to go much more in-depth with your content and experimenting with some different sales methods that would be a little too risky to try out on your parent site. In this case, these are dedicated external domains for each of your locations. External microsites are similar to internal ones, though each location rests on its own unique domain. In the Clair’s Cleaning example below, each website is tailored to specific locales in order to once again go after long tail local keywords. Take a look at Precision Garage Door Repair as an example of a company who utilizes this site structure well. You see all of their locations right on their homepage, and when clicking on any of them, you get redirected to a separate website such as the Los Angeles and East Bay locations. As you can see, you are doing each of your locations a major disservice in the SEO realm if you don’t have internal and external microsites. The downside is that they do require a bit more financial backing and effort. It’s going to depend on how many locations you have in addition to the amount of resources at your disposal. If all of your locations are closer together, having location pages is the recommended site structure. Internal and external microsites will shine if you have a lower density of locations. 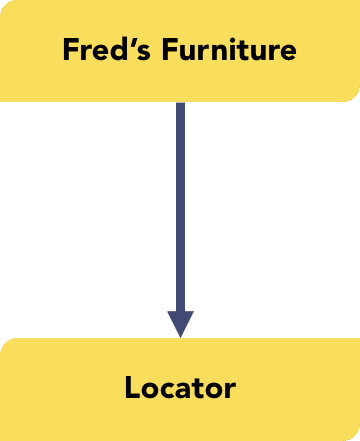 Location pages are the ones that we find are used the most due to their considerable balance between being able to target local searchers without having to invest heavily. With locator pages, you aren’t able to compete on a local level because you only have a single page that lists all of your areas and products or services that you offer. Hopefully all of this information gave you a better understanding of how to organize your site structure for your multi-location business. It’s something that might slip through the cracks, but is monumentally important to the success of your company. Location pages and microsites are your keys to dominating the local SEO game.